The FingerAlphabet Cool KIDS Word Search books are a fun way to strengthen your fingerspelling abilities. 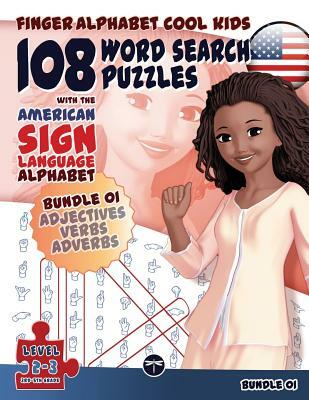 This bundle includes the word search puzzles of the first three titles: adjectives, verbs, and adverbs (3rd-5th-grade vocabulary). - learn the correct American Sign Language Alphabet - all hand shapes are consistently shown as seen by the viewer Approved by experts from Gallaudet University. - learn the correct spelling of words by associating two different representations of letters. - reinforce and hopefully, expand your active vocabulary. - get a basic insight into the how-tos of fingerspelling. - get additional charts of the alphabet to cut out and pass on to friends. The bundle provides 108 puzzles with clearly marked levels of difficulty. Solutions are provided in the final section of the book.